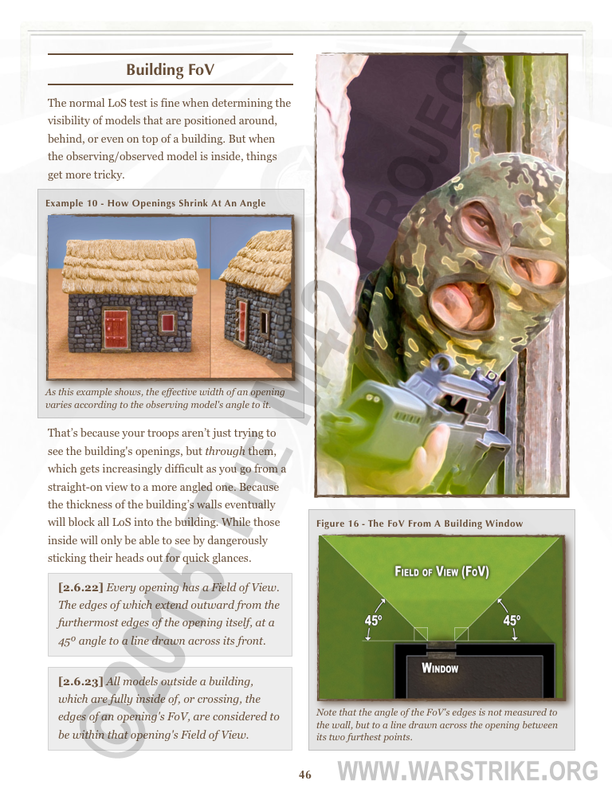 Here's the rules for spotting the enemy, plus a nice little composite illustration to go along with it. That leaves just the cover rules to do before this section is complete. Two pages tops. 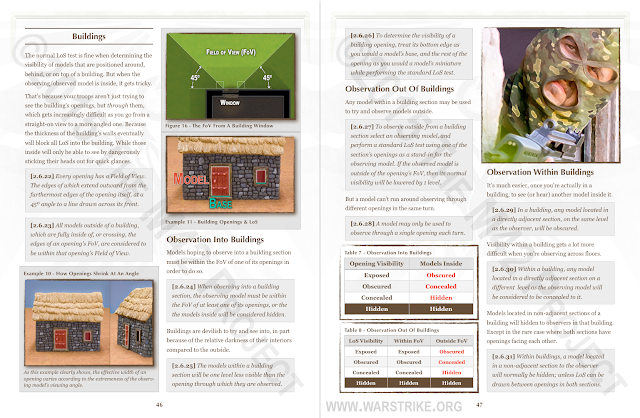 The final 2-3 pages in this section will deal with the concepts of "Spotting" and "Cover". 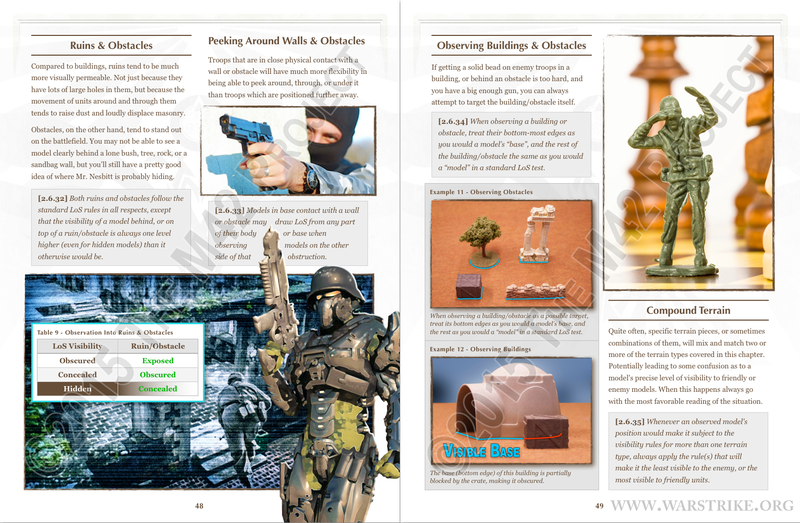 After that, I'll be able to properly write up the new Shooting section. 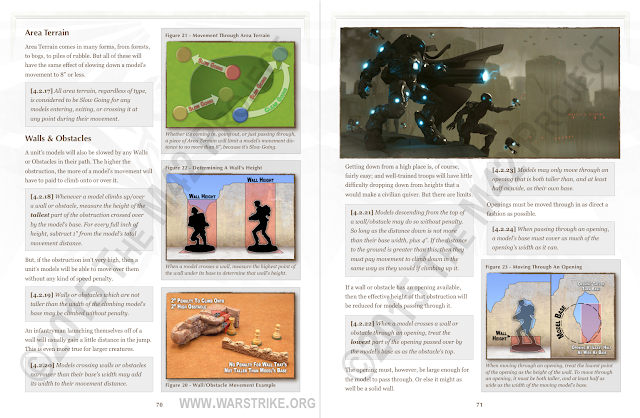 Same pages as last time, but tweaked for clarity. Well, I promised no more than 2 additional pages of building rules, but I was actually able to keep it to just one. 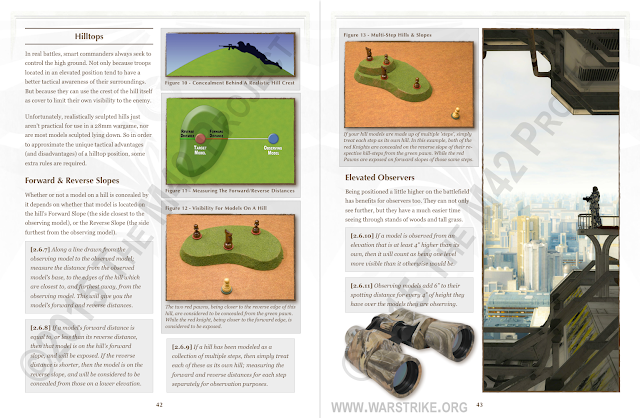 So it's 2 pages total with the FoV rules included. I've got company coming tomorrow, so I'll be too busy to work on the game for the rest of the day. 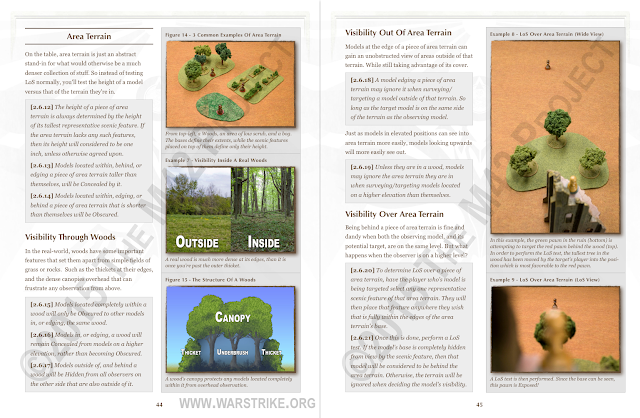 But here's the Area Terrain section of the rules. There's a few tweaks here and there, but long time readers have seen most of this before. I'm on a roll tonight, I guess. 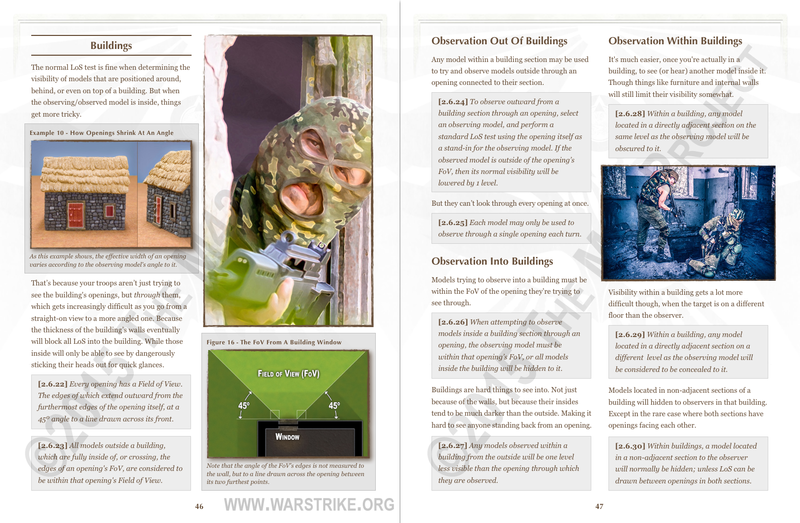 Here's the next two pages of the new Observation section. Here's the first 2 pages of the new "Observation" section, so-called because the later rules will tell you to "Observe" a target, etc. Basically, this is where I'm putting all of the old visibility rules (polished up a bit) so that they don't overburden the Shooting section. 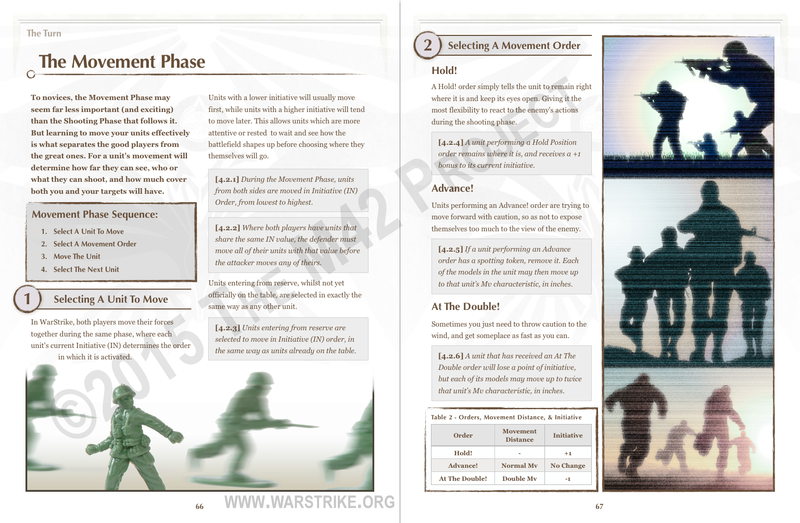 Here's the final part of the Movement Phase revision. The bits about moving around the enemy got hacked down quite a bit, since you can't actually move into engagement in this phase anymore. 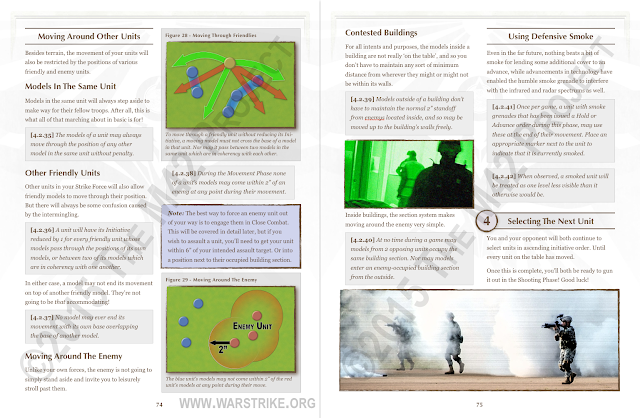 There's some new stuff about moving around in contested buildings, and the ability for a unit to use smoke. Which uses a simple 40K-ish status marker instead of laying down a template. 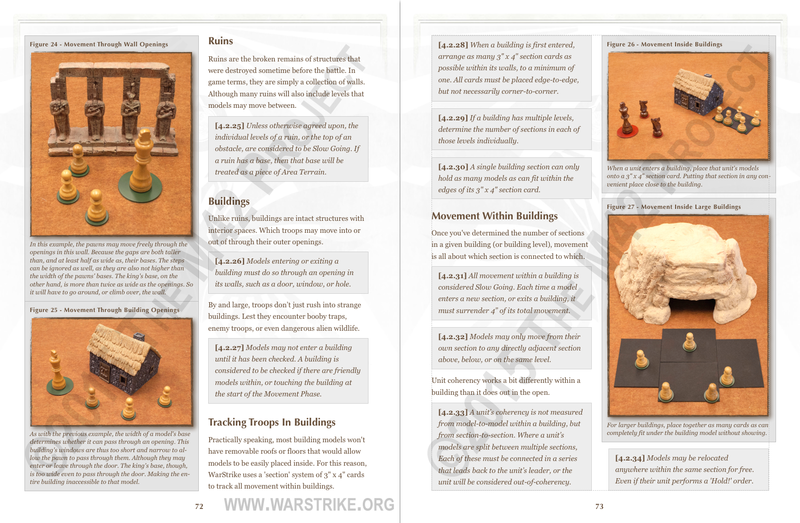 Yes, the building rules will be back in the main rules sections, but more simplified wherever possible. 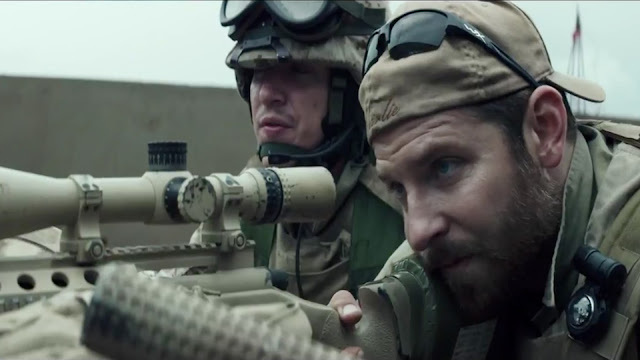 Especially when we get to the Shooting Phase. Here's the next two pages. Not much has changed besides a word here or there in the rules, an extra descriptive sentence or two, and the updated layout. Biggest change is that Slow Going terrain causes a model not to be able to move more than 8" if they touch it during their move. The kids are all off to camp this week, so a blessed peace has descended on the Wyrm-abode. 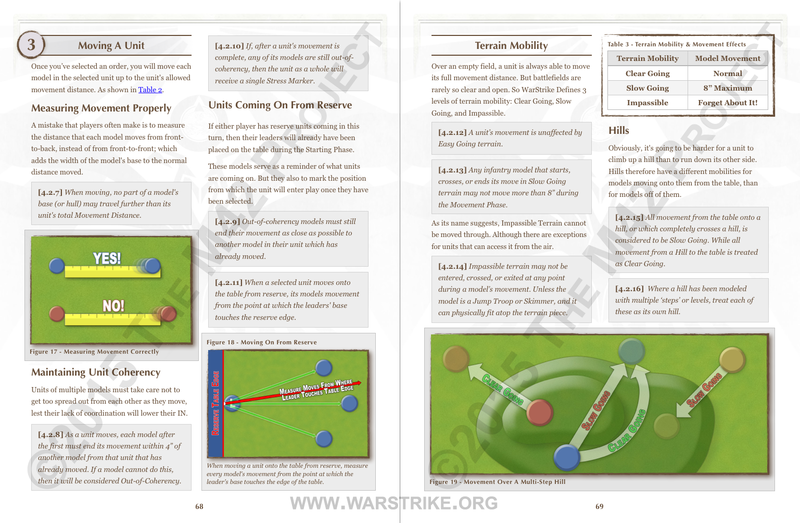 As such, I'm finally able to get some work done on revising the Movement Phase rules to fit the new outline. 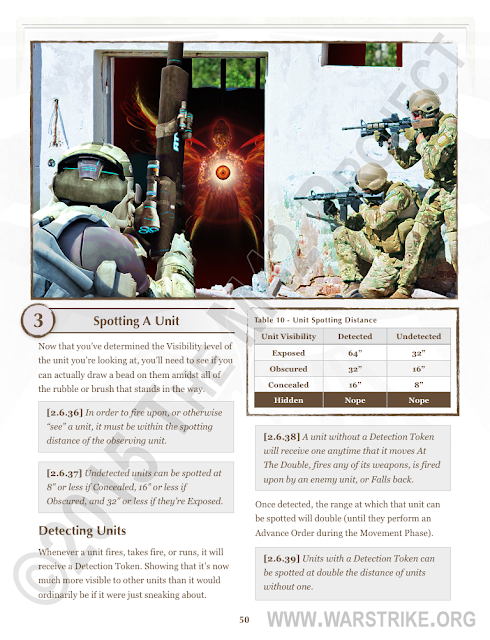 In the interests of promoting movement in the game by making it safer under certain circumstances to move a little bit than stand still, I'm working on a spotting system that would make units easier or harder to see based on their actions during the turn. 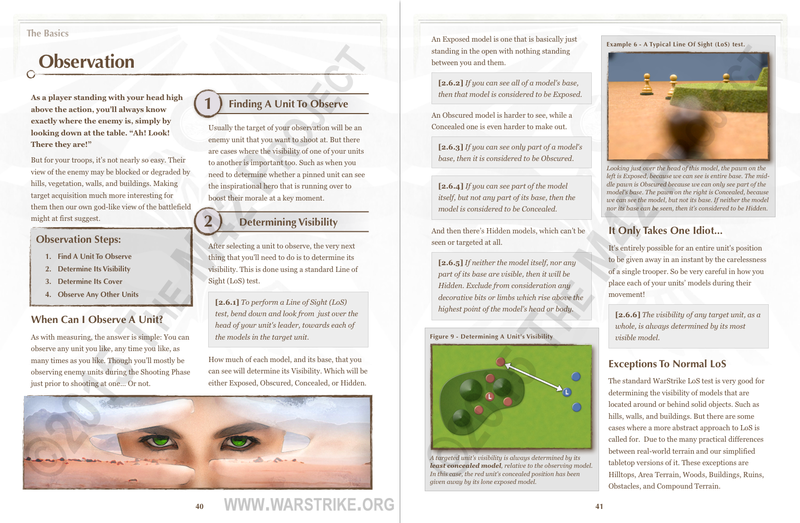 Using a variation on an early idea that we discarded for our visibility system.